An average of 11.7 such fires are reported globally each year, by media, campaign groups and other publicly-available sources, but this is likely to represent just the “tip of the iceberg”. There could in fact be 117 turbine fires each year, it argues, based on analysis showing just 10pc of all wind farm accidents are typically reported. Fires tend to be “catastrophic”, leading to turbines worth more than £2 million each being written off, because the blazes occur so high up that they are almost impossible to put out, it warns. Turbines are prone to catching on fire because their design puts highly flammable materials such as hydraulic oil and plastic in close proximity to machinery and electrical wires, which can ignite a fire if they overheat or are faulty. The main causes of fires are lightning strikes, electrical malfunction, mechanical failure, and errors with maintenance, it finds. 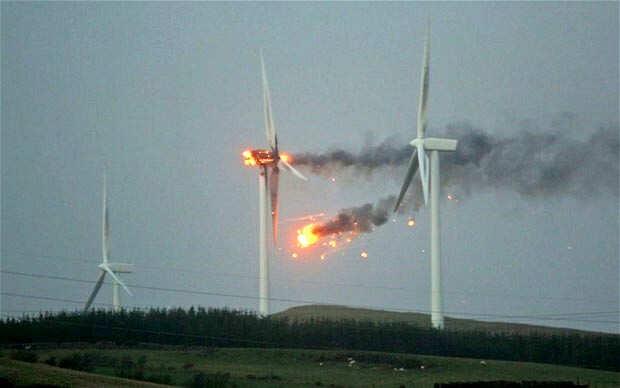 The academics used data compiled by the Caithness Windfarm Information Forum (CWIF), an anti-wind lobby group, which records 1,328 accidents involving wind farms globally between 1995 and 2012. Of these, 200 – 15 per cent – involved turbines catching on fire, implying 11.7 fires per year. But the report, published in the journal Fire Safety Science, also back CWIF’s view that the true number is far higher. It points out that the wind industry body, Renewable UK, has admitted there were 1,500 wind farm accidents and incidents in the UK alone between 2006 and 2010 – while just 142 individual accidents in the UK were documented in CWIF’s database over the same period. He told the Telegraph he believed it was “the responsibility of the industry” to keep a proper database and believed the industry itself had been “surprised by the magnitude of the problem”. UK cases highlighted in the report include a 100-metre tall turbine that caught fire during hurricane-force winds at Ardrossan in North Ayrshire in December 2011, reportedly due to a lightning strike. The wind turbine was completely burnt out and debris scattered over large distances due to the strong wind. In 2005, a turbine at the Nissan factory in Sunderland was engulfed in fire before falling onto a nearby A-road, causing traffic disruption. The blaze was believed to be caused by a loose bolt jamming a mechanism, causing it to overheat. A spokesman for Renewable UK said it did “not have numbers of fires as in many cases these do not need to be formally reported”.